The first thing you hear in Mexico’s San Miguel de Allende are the bells—real bells—weathered metal in old, stone church towers, clanging with the ancient echo of something unmistakably historical. It is Christmas Eve—the heart and soul of the holiday in the Plaza Principal—and the square is crowded with celebrators. Poinsettias fill the greenspaces in the Jardin—the locals’ name for the Plaza—and the lights come up amber and gold in the spires of the rococo-gothic Parroquia, a huge, goddess of a church with her faced turned sweetly towards the square, spires opening into the early night sky like rose-colored, alabaster fingers reaching heavenward. The place is packed—farmers with the smooth-skinned heritage of Mayan history on their faces blend in with the urban tourists from Mexico City; craftswomen from the countryside sell beads and scarves as local ranchers saunter past them in cowboy boots. Vendors sell roasted corn, spiced nuts, carnitas, and sweets from wagon stands—ice creams in flavors like rose, papaya and lime, and hot churros, the finger-licking doughnuts that are so popular here. We sit on a bench, watching the sun set over the throng, and as the twinkling holiday bulbs strung across the churches pop-on in strands, a group of ex-pats gathers near us and begins to sing Christmas carols. There are churches upon churches in San Miguel—old stone and brick, and some right next to each other—and on this evening, all of them are decked out in the merriment and reverence of the holiday, unapologetically draped with more lights that we’ve ever seen adorn churches. Huge Christmas trees fill the Jardin, and candles light the open doors of sanctuaries as mariachi bands play on church steps. Earlier in the afternoon crowds of women came pouring out of midday mass with dolls dressed in exquisite christening dresses, the streets and plazas suddenly filled with flowing, white fabric and new-birth imagery. There is nothing demure about this experience, and as I sit across from the Parroquia holding my husband’s hand, I find the word: elation. It’s a party and the whole town is invited, and there is none of the American tendency to downplay or hesitate. It’s a palpable difference, a familial joining of all peoples, and I am overwhelmed by how touching it is. All night long on this night, long after the evening services are over and the Jardin has gone quiet, families will gather for feasts in the courtyards of their homes. Fireworks will blaze across the city’s sky, cherry bombs rattling the ground in every neighborhood and sparklers streaming on each street corner. Guitars will strum and whole families will sing into the night, some until the early morning hours. The festivities will last more than a week, as more and more Mexican tourists pour in from the cities and countryside, until the last celebration of the festival season—Three Kings’ Day, on January fifth—the day when children finally receive their holiday gifts. 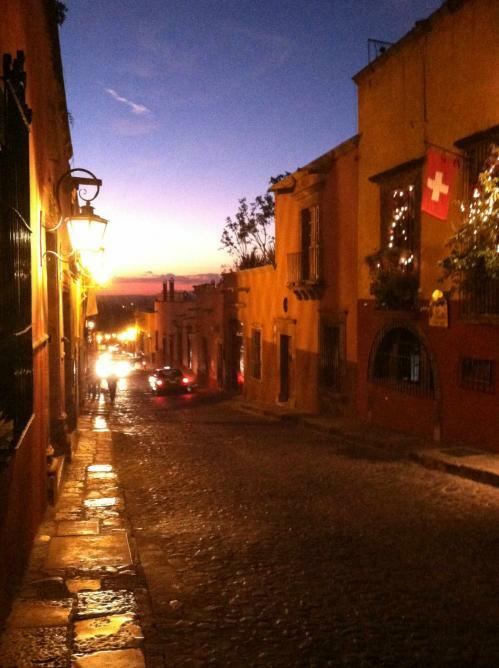 I have long yearned to come to San Miguel de Allende—at any time really, but certainly during a festival—to experience its art, its historical architecture, and its cultural vibe. I have also wanted to learn why so many Americans—artists in particular—have moved to this town, set down roots, and stayed. I had sensed that there something about the place that was going to sing to me, that was going to light up my creative sensibilities and drown out the tech-gadget focus of American commerce. My intuition could not have been more dead-on. I am always charmed by plaza-centered towns, particularly if the square is vibrant and alive, as it is in San Miguel. So it took just an hour or two to realize that the Jardin is really the heart of the place, a working center in which everyone seems to meet up sooner or later. San Miguel is a walking town, and though there are plenty of cabs and local cars inching along the cobblestones and narrow avenues, the spirit of the place is on every street—open air markets, artisan shops, the simple open-door, home-based stores that sell everything from tortillas to shoes to fine art, and the stone and wooden benches in small plazas and parks to rest upon for a moment before walking on. Crossing the entire city takes only about 40 minutes on foot, and its hilly terrain makes for fabulous wandering experiences rewarded by thrilling views. Visually, it’s a color field to delight the eyes. Everything is vibrant. The historical face of the town has been preserved by wise city officials who have not allowed construction unless it’s in harmony with the old architecture. (In fact, the city’s residents recently protested a Starbucks coffeehouse project just off the square until the company crafted an authentic Mexican-tiled structure that’s nothing short of luxurious.) Still, there’s tons of hip gentrification, and new, urban, clean-lined homes line the side streets of almost every block and sit in sweet harmony with the old walled-in courtyard homes—all of them painted brightly in oranges, yellows, reds, blues and greens. Walking the streets is a feast for the eyes, and I was daily drawn in by the Rothko-like color fields on walls and the sensuousness of vibrant hues. Like many Mexican towns, there are no street-facing fronts to the houses in San Miguel. 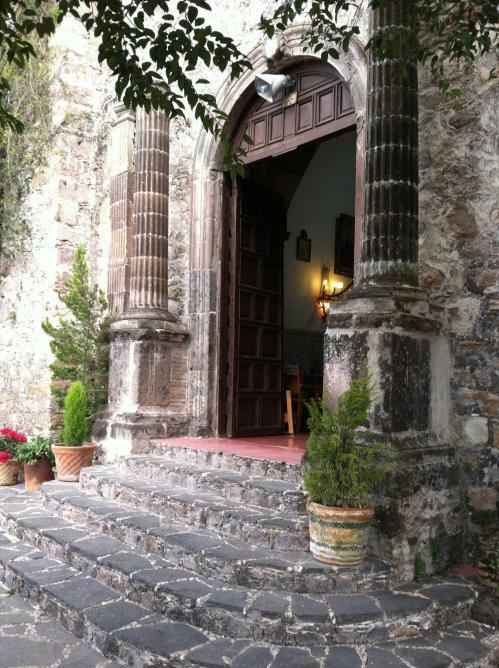 Antique double doors open into courtyards, and roof decks line the city’s hills, looking out over the pearlescent amber hues of the Parroquia. Hilly streets in cobblestone, two-foot-wide sidewalks in flat rock, and contemporary gentrification seamlessly dovetail with centuries-old field stone structures, and the simplicity of the aesthetic made me wonder: Why did we Americans never find the architectural harmony of side-by-side old and new? One of the gifts of staying in a house versus a hotel is frequenting the lively markets for foodstuffs. On our first day my husband got us out of the house and down the hill to the Mercado—the blocks-long covered market that houses butchers, fruit and vegetable vendors, crockery sellers and more. 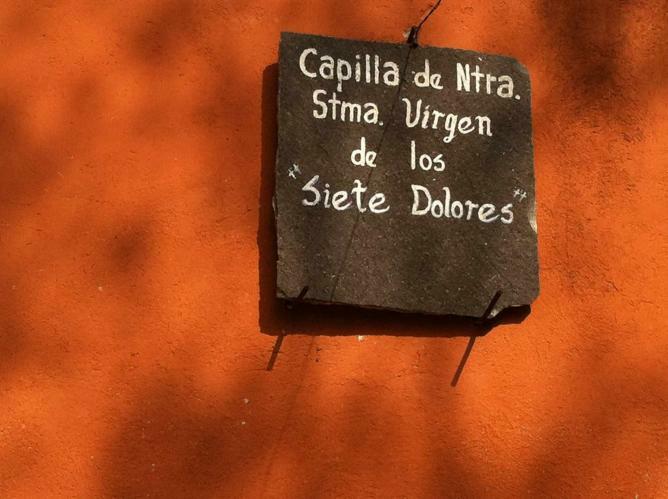 All along Calle Homobono—the street we would trod up and down each day to get to the center of town—local vendors opened their wooden double doors to sell their wares and services: Miguel sold milk, eggs and juice; Adrian and Juan repaired shoes; Dolores sewed and repaired clothing. Mary, our just-a-block-away neighbor, made homemade tortillas from a soaked corn and lime mush, and grilled them right before our eyes. A bag of about 30 tortillas cost less than a dollar. At 6,500 feet, the town sits dead-center in the middle of the country, a three-hour drive north from Mexico City. In mid-winter, when we were there, the temperatures can fluctuate wildly—from 70 degrees and sunny by day, to as low as 40 degrees at night. It is mountain-plateau country, and its charm is that it remains mild during the hot summer months as well. That said, packing is a challenge of weather-inclusivity—and walking shoes, coats, and lightweight, almost-summer clothing are all must-have’s for most of the year’s traveling dates. San Miguel was once almost deserted in its post-silver mining years, and its residents dwindled severely when the mines dried up. Its rejuvenation came during the pre- and post-World War II era, when the art schools Bellas Artes and Instituto Allende opened their doors, and Americans began coming here to study. Many stayed on and carved out lives here, and years later, the town’s creative soul—designers, craft artisans, painters, sculptors, musicians, writers—still remains intact. On month-long international forays like the one we were on, my husband prefers a town with buzzing culture (versus a slowed-down beach vibe) in which we can immerse ourselves daily in some artistic diversion. San Miguel was that in spades. A few nights before New Year’s—and for about $35 for two tickets—we saw Doc Severinsen play at the Teatro with a Latin fusion band. Doc, who lives in the area, put on a knock-out show, blasting away in the 500-seat antique stone theatre space. A few nights later—for $7 a piece—we saw a Jazz guitarist and percussionist at the biblioteca’s performance space; and on another evening, wandered into Johnny’s Bar, where a hip band and belting singer played everything from Johnny Cash to Jazz Standards. The musical scene is polished and professional (Brian Sietzer from Stray Cats fame strolled into Johnny’s on the night we were there), and because it’s inexpensive, it’s completely accessible. Nightlife is hip but cool; a smooth, celebratory vibe with no edginess. The main art scene in the city is the Fabrica la Aurora, just outside of town, housed in a 1930s thread and fabric weaving factory which has been converted into swanky gallery spaces. It’s high-end (think: New York or San Francisco galleries), but we also found affordable craft art, glass crockery, and a terrific café to lunch in. The best art finds we discovered were in town—particularly the Saturday and Sunday street art held on both the north and south end of the Parque Juarez—easy walking distance from the Centro. There we found paintings, sculptures, leather goods, purses, jewelry and more. We went home with two paper abstracts from artist Ramsees Oliveras, who’s in the park each weekend, and were wowed by the affordability of the pieces there. In town, our favorite gallery was the clean-lined, white-space Arte Contemporaneo, a gorgeous gallery with a lovely sculpture garden, where art objects started at about $150 and small abstract paintings at $500. 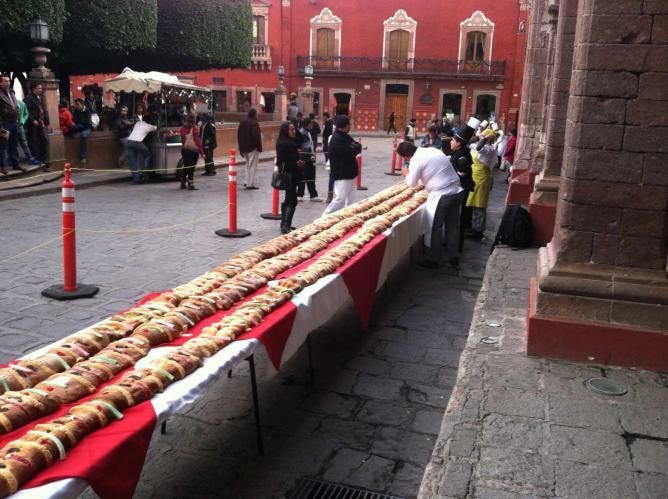 Mexicans—like Americans—love to eat, and cuisine abounds here. There is no shortage of international dining, and standards are high and the fare is delicious. Berlin Bar was a continental standout for sure, and though the bar can get a bit boisterous, dining is in several small, more intimate rooms away from the action. (Don’t miss the huge stewed pork shank, or the simple-but-elegant whitefish in broth.) For Mexican food, we loved El Correo (on Correo, just up from the Jardin), for their Chilies Rellenos and green-sauce chicken enchiladas; Heche in Mexico (on Ancha de San Antonio) for carnitas, and Café Parroquia for an interesting mix of French and Mexican flavors. La Parada was a standout for Peruvian, and the patina of stone in the courtyard was stunning. Café del Diezmo’s Yucatan enchiladas smothered in pumpkin seed and cream sauce was a favorite. For street food, the vendors on the corner of Insurgentes and Relox put up a delicious dinner for next to nothing. (There are long lines each night for a reason.) At Buenos Aires café, my favorite dish was the owner’s mom’s recipe of gnocchi made from ricotta in a simply spiced red sauce, and La Grotta won our hearts with the best authentic Italian in town, complete with amazing homemade pastas. Hotels abound, and there is at least one on each block of every city street. The South end of town houses the swanky American-priced Rosewood and Hotel Nena—both beautiful and well-attended by incredibly courteous staff, and set in the neighborhood just near the Parquet Juarez. Though certainly the expensive hotels are lovely, we were drawn by the intimacy of the smaller hotels, and with a little effort, it’s easy to find lovely and charming places to stay with incredibly affordable fares. My favorite mid-range finds were the Casa Calderoni ($100 & up); La Morada Hotel ($150 & up); Casa de la Cuesta B & B (from $165; mask museum and art gallery, too); Villa Mirasol Hotel (from $95); and the simple but incredibly affordable Villa Santa Blanca ($55 and up) and Casa Mia (from $84). The best of the moderately priced hotels was the lovely Casa de los Olivos Hotel, just steps up from the Jardin ($222 and up), with exquisite service, grounds and authentic charm to spare. After a good two weeks of walking the town, we settled into our daily routines—coffee at Café Casa, a walk to the square, a yoga class, a visit to the library’s courtyard—and we began to feel that we were more than visitors. We were feeling the soul of the place, an easy permission to relax into a slower pace, and an ability to take in—and hold in our hearts—an artistic view of the world. On our last few days, new friends took us outside the city to the tiny town of Atotonilco, where a white-washed church houses what the locals call ‘the Sistine Chapel of Mexico,’ a church with a ceiling-painted fresco that was exquisitely painted in black and white detail. After a day of exploring, we lunched at the beautiful Nirvana—a hidden away hotel and garden café that rivals Santa Barbara charm; and on our nighttime, after-dinner walk through the square, late at night and with just a handful of locals lingering on the Jardin’s benches, a fully decked mariachi band sauntered up and began playing to us. In a few moments a local man jumped in and began singing—belting his beautiful baritone—and suddenly we were on our feet and dancing. The moon shone, the Parroquia shimmered in the lights, and there it was: A simple sense of community, no matter what our separate walks of life; a reaching out, an appreciating; a taking in of all that is sweet, together. When our month ended, I stood on a step across from the Jardin, from the square in which we had spent so many magical hours, and I blew the town a kiss. Our month had been nothing short of magic. The bells rang one last time for us, and the tranquil longings of my heart were awakened and satisfied. 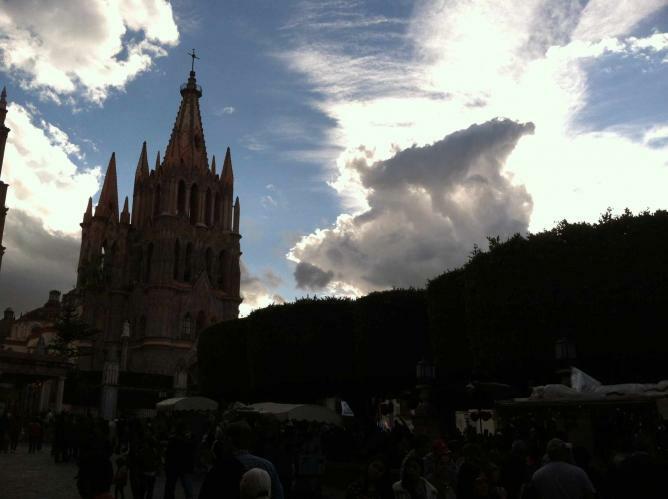 San Miguel de Allende would live on in my memory with all its art, its music, its friendship and its glory.